Many of the things I love about a Boston Handmade get together is we get to share experiences, maybe learn a new skill, and ask members about their craft. In my case, I finally learned how to crochet. Diane, of Lady Dye Fiber Arts, took the time to show me how to do a chain and off I went. I do have to keep practicing! Diane also, spins her own yarn. 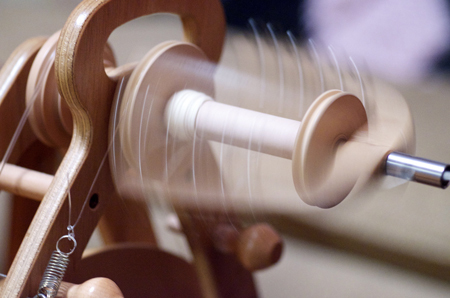 It was great to watch her spin and ask her about how where she buys her wool and how she dyes it. Often our meetings are a sharing of information and support for our craft. Later, in the evening we turned our meeting from learning crochet to talking about being a small business person. Jessica Burko and Lynn Mohney were also in attendance. Lynn decided to learn crochet, as well. Jessica was well into a knitted skirt for her daughter during our get together. It is always fun to see people create. 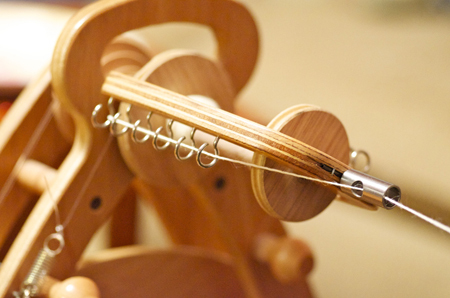 Is there a craft you would like to learn or spend more time on? I would love to spend more time on knitting...I haven't done that in a couple years, and I have a project I started in 2011! 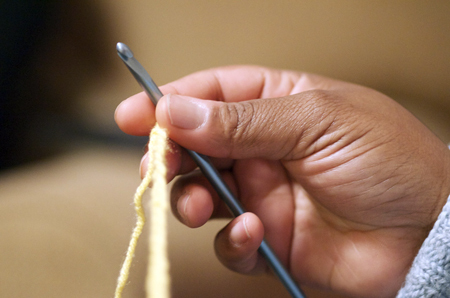 Bev, definitely bring your knitting to the next Boston Handmade member meet-up (coming up April 8), we'll help you get that project back in action!